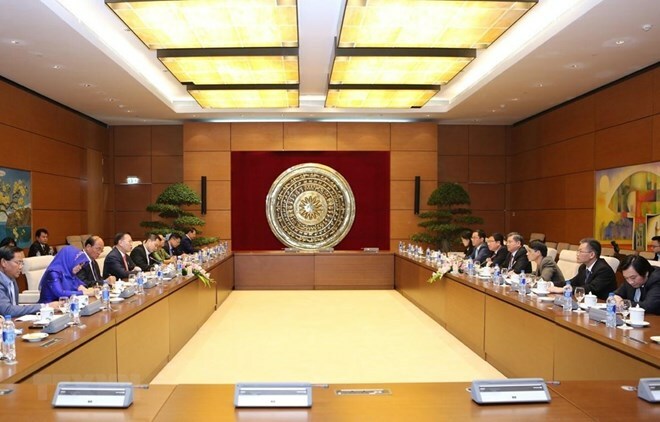 Hanoi (VNA) – Chairman of the National Assembly’s Committee for External Relations Nguyen Van Giau has affirmed that the Vietnamese legislature always supports the strengthening of traditional friendship and cooperation with Cambodia and its lawmaking body. During a working session in Hanoi on March 22 with Chairman of the Cambodian National Assembly’s Commission on Foreign Affairs, International Cooperation, Information and Media Chheang Vun, Giau congratulated the Cambodian parliament on successfully holding the 27th Annual Meeting of the Asia-Pacific Parliamentary Forum (APPF-27) in Siem Reap. Over the past years, the two legislatures have well implemented the cooperation agreement that they signed in April 2012, facilitated regular exchange of high-ranking delegations and worked closely together at regional and global forums to which the two legislatures are members, contributing to fostering cooperation, mutual trust and understanding. Giau suggested that the two sides should improve the efficiency of collaboration at regional and global inter-parliamentary forums for the benefit of the two countries’ people and for peace, stability, cooperation and development in the region and the world, as well as share experience in the building of institutions and laws and the supervision of law enforcement. Chheang Vun, for his part, said the successful hosting of the APPF-27 is an achievement of not only Cambodia but also member legislatures. He added that the Cambodian parliament wants to learn from Vietnam’s experience in hosting big events and always supports Vietnam’s stances at parliamentary forums such as the APPF.